This WWII memoir, filled with detailed personal stories, provides a realistic and riveting account of one naval aviator's experiences from his first days of training in the summer of 1942 through the end of the Pacific War. Unlike most wartime memoirs, the book does not focus on James Vernon's time in the war zone, near Okinawa and mainland Japan, from the end of May 1945. Only 5 of the 21 chapters cover this phase of his career, and he instead provides many interesting episodes from his extremely thorough training period. In contrast to the majority of Japanese kamikaze pilots near the end of the war who he describes as having received "minimal training in navigation or anything else," he spent almost three years in learning to be a highly proficient pilot. Even though the subtitle indicates Vernon was a Grumman F6F Hellcat flier in WWII, the cover jacket has a misleading photo of Vernon's dive-bombing training group in front of a Douglas SBD Dauntless dive bomber. Actually, in August 1944, Air Group 87 had a significant reorganization that cut the number of bomber and torpedo aircraft and increased the number of fighters, so at that time Vernon began training on the Hellcat. Although the Hellcat was designed as a fighter, Air Group 87 tested to what extent this fighter could be used as a dive bomber. The chapters are organized chronologically, and the author keeps focused throughout the book on his personal story rather than drifting into extended general historical background. Even though the book was published about 60 years after the events, Vernon provides many details and writes as if he were a young man at the time. He has changed the names of a few men mentioned in order to protect their privacy. Several passages openly describe his relationship, at times strained, with his broken family in which his father worked in Montana and his mother in San Francisco. In addition to several personal photos in the book, the U.S. Naval Institute has provided helpful photos of different types of aircraft in which he trained and fought. A few recurring themes permeate this memoir. 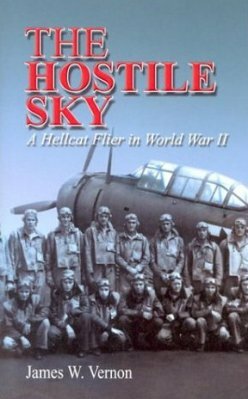 As indicated by the title The Hostile Sky, flights even in training could be quite dangerous, and Vernon lost several comrades even before he reached Okinawa. For example, one pilot lost his life in training while trying to dive bomb a Hellcat as it went into a steep dive, then a spin, and crashed into the sea after a piece of the left wingtip ripped off and hit the tail assembly. The first half of the book describes in several places the concern that many Navy airmen had of washing out of flight training and then having to become an ordinary seaman. Vernon's life in the Navy had constant changes as he went to several U.S. locations for training and served aboard two different aircraft carriers, so his relationships with others were also constantly altered. The book has a few references to Japan's kamikaze operations, but Vernon did not encounter any kamikaze aircraft as his assignments generally were to strafe and dive bomb enemy airfields. He did serve aboard the aircraft carriers Randolph (CV-15) until late December 1944 and Ticonderoga (CV-14) from early May 1945. However, he missed the kamikaze attacks that seriously damaged both carriers: Randolph with 28 dead and 106 wounded after a Ginga bomber hit the flight deck at Ulithi (March 11, 1945) and Ticonderoga with 143 dead and 202 wounded after two kamikaze aircraft hit the ship off Formosa (January 21, 1945). On May 28, 1945, the same day that two kamikaze aircraft crashed into and sank the destroyer Drexler (DD-741), he took off on his first combat air patrol 40 miles north of Okinawa, but he sighted no enemy aircraft. Soon after, he went in a group of 16 fighters to strafe Ronchi Airfield (referred to in Japan as Kokubu No. 2 Airfield), a known launching point for kamikaze aircraft, but he describes the negligible effects of such a raid in which they flew a total of five and a half hours with danger of getting hit by flak from enemy guns near the airfield or encountering enemy fighters along the way. Vernon writes that at the end of July 1945 he "had now logged dozens of hours on stupefying combat air patrols with never a sniff of an enemy aircraft" (p. 171). In contrast, near the end of the war a lucky replacement pilot aboard Ticonderoga on his first combat air patrol shot down a kamikaze pilot in a Judy dive bomber. On August 15, 1945, Vernon got word of the war's end while in the air on a defensive combat air patrol searching for a possible enemy plane that had been sighted on the radar scope of their fighter direction center. Vernon writes in the Preface that he could never have completed The Hostile Sky without assistance and criticisms of members of the Ventura County Writers Club and his creative writing teacher. This personal wartime history is a fine example of how good a narrative can be by a beginning author who has an interesting story to tell.